It was the holiday season of 1980. 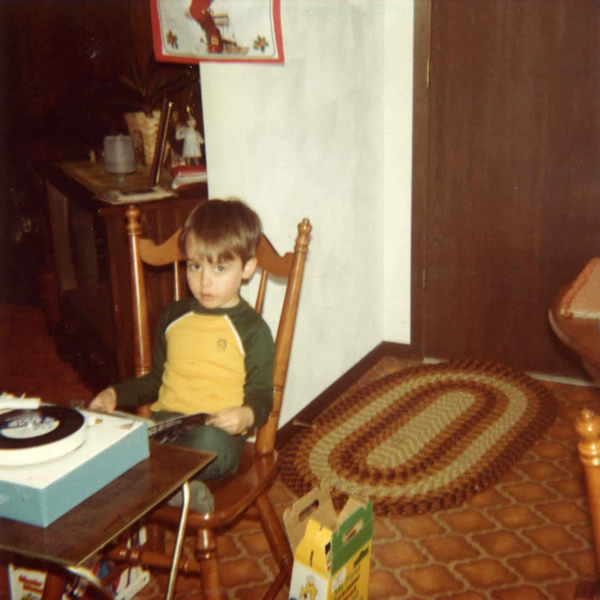 Four-year-old Tim clearly liked to listen to records just as much as 39-year-old Tim still does. On this particular afternoon, my record of choice, spinning on my turntable as my mom snapped my picture, was the Star Wars story. I can only assume that I listened to plenty of other records that day as the Supercase I shared with my brother was at my right side. Although technically belonging to my brother, the Supercase is currently located in my basement just in front of a foam-board-mounted Jose Canseco poster. It's held the same records now for over 35 years. Speaking of record cases, on my other side you'll notice a yellow and green box full of 45 records -- it's the box from "My First Sesame Street Record Collection." All these years later, my brother still uses this box to store those same records. Finally, on the wall behind me, you can see the bottom of a Coca-Cola Christmas decoration and it probably comes as no surprise that this is still part of my family's annual holiday decor. It's currently hanging on the wall in my son's room. 11 Words That Don't Rhyme With "Christmas"